On Saturday 17th May our Buckinghamshire-based string quartet played for a wedding held at the picturesque church of St Mary Magdelene in Upper Winchendon (a small village near to Waddesdon in Buckinghamshire). Although I knew that we were going to be playing a in a gallery, it turned out that the area overlooking the aisle was the ringing chamber for the church bells (not rung since 1985 on account of the unstable tower!). As such, it was a real challenge getting all the instruments and stands up the vertical stepladder without doing any damage to them. Once we were all assembled though, the sound must have projected effortlessly across the church. We played Pachelbel’s Canon in D for the bridal entrance and Stevie Wonder’s ‘Signed, Sealed, Delivered I’m Yours’ for the exit of the bridal couple. For the signing of the register there was a mixture of Des’ree and Bob Marley. We then departed and rejoined the guests at The Dairy at Waddesdon Manor, one of our most regular venues. 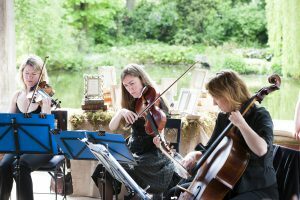 The beautiful pond at the back provides the most wonderful backdrop for any celebration, and all of the wedding party enjoyed themselves to a backdrop of rock and pop covers spanning the 1960’s through to the present day!